Based on King Street, Wallasey test centre can be found next to McKeevers Chemists and Egremont Medical Centre. Though small in size, this unassuming building oversees a heavy number of driving tests each month. If you're heading here for the final hurdle on your way to becoming a fully qualified driver, we'd recommend getting to know more about it. Read on for directions, pass rates, test routes and much more about Wallasey. Around 10 minutes from the centre of Wallasey itelf, the test centre is located right next to the A554 and A59—learner drivers won't have any difficulty with finding it. If you'd like to take a look around Wallasey tets centre prior to your practical, you can find directions here. The DVSA doesn’t publish test routes anymore, so we can’t tell you exactly what will crop up on your test. You can get a rough idea, however, by watching videos of Wallasey test routes on YouTube or by downloading our sample Wallasey driving test routes. Your instructor will be more than familiar with the road types and features favoured by examiners on the Wallasey test routes. They will slowly introduce you to these roads and have you honing your skills on them as you progress through your course. By the time you're ready to take your test, you'll be comfortable with Wallasey's heavily-congested roads and residential areas. Curious about your chances of passing your driving test? Feast your eyes upon these driving test pass rates! The current national pass rate for the UK is 47%, increasing to 47.3% for learners in the North West. But what about Wallasey? Get the full details for pass rates in the last five years below. Whilst Wallasey’s pass rates have been below the UK’s average pass rate, they’re not too disappointing. It’s important not to get too held up in statistics, as it all comes down to your own individual ability and how you act on the day of your test. If you’re an anxious driver, you might find some helpful advice in our guide to learning to drive with anxiety. What If I Can't Go To Wallasey? If you can’t head to Wallasey, there are other test centres in Merseyside that you can go to. The nearest centres to Wallasey are Upton and Norris Green. You don’t have to wait long to get your test results. Once you're back at Wallasey test centre, the examiner will walk you through your driving faults with a feedback sheet. If you're successful, you'll get a test pass certificate and the option to send off for your new licence. While some learner drivers pass first time, others need another chance or two to get it right. If this is the case for you, don’t worry about it! With PassMeFast, you can fast-track your practical and offer you extra tuition so you can iron out those bad habits. To get booked in, simply contact us via our website or talk to us directly on 0333 123 4949. Tired of wasting your time and money on single lessons? Maybe you should take an intensive or semi-intensive course instead. Why? So you have the advantage of fitting your course entirely around your schedule. With our experienced instructors, you can build up your driving knowledge quickly and completely avoid long waiting times with our fast-track practical tests. Don’t settle for second best. Pick a suitable course from our course prices page and book a course online. Alternatively, if you’d rather get in touch directly—or get advice as to which course is best for you—you can speak to our sales team directly on 0333 123 4949! PassMeFast was the best decision I have ever made. 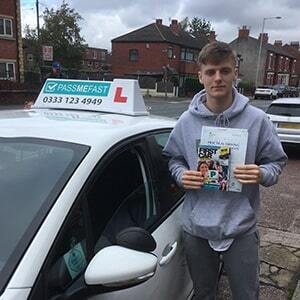 I recommend PassMeFast to anyone who is learning to drive, amazing service and no delays.